A blog mainly devoted to chess. Do these even exist any more? Once again there were a number of worthy contenders for the Chessexpress Australian Player of the Year. Both Moulthun Ly and Max Illingworth lead the way for the younger brigade with good performances for Australia at the 2012 Olympiad. Anton Smirnov showed he is also likely to join them in the near futire with a win in the 2012 Australian Masters, while Brodie McClymont won a number of weekend events to confirm his obvious promise. But I look back to the start of the year for a set of performances for this years winner. GM Darryl Johansen started off by winning the Australian Championship for a record 6th time. He then followed this up with a win on tie-break in the 2012 Queenstown International, scoring 7.5/9 against a very strong field. He also won the 2012 Fiji International Open with a perfect 9/9. So congratulations to GM Darryl Johansen for being the 2012 Chessexpress Player of the Year. One of my little Olympiad jokes is to offer my opening choices to the highest bidder. I'm sure there is someone who has invented a pet opening or line who would be willing to see it played on board 66 of the 2014 Olympiad. This might solve the problem of the lack of Hammerschlag's or Sodium Attacks in chess databases, although there are ways to improve this situation. In the old days, thematic tournaments were organised. These were normally double round robins where the players were required to start from a fixed position or opening. A number of tournaments to test the Rice Gambit were arranged in the late 19th century but such tournament are less common theses days (A Open Sicilian event in Argentina is the last I can recall). Such tournament still exists in Correspondence Chess these days, but even they shy away from anything completely outrageous. One opening that could do with a few more games is the Tumbleweed (mentioned in passing here). In my database the line 1.e4 f5 2.exf5 Kf7 3.Qh5+ g6 4.fxg+ Kg7 only shows up 6 times but of those 6 games the score is 3 draws and 3 wins for Black! Is it the case that no one keeps track of the White wins, and only Black victories are savoured? Or that no one is really to 'take one in the name of science' and lose a few games for the sake of research results. Maybe 2013 can be the year of the Tumbleweed, where a few brave souls gain a degree of immortality by increasing the number of 1.e4 f5 games on record. From the inventive mind of Henry Ernest Dudeney comes a couple of chess puzzles. 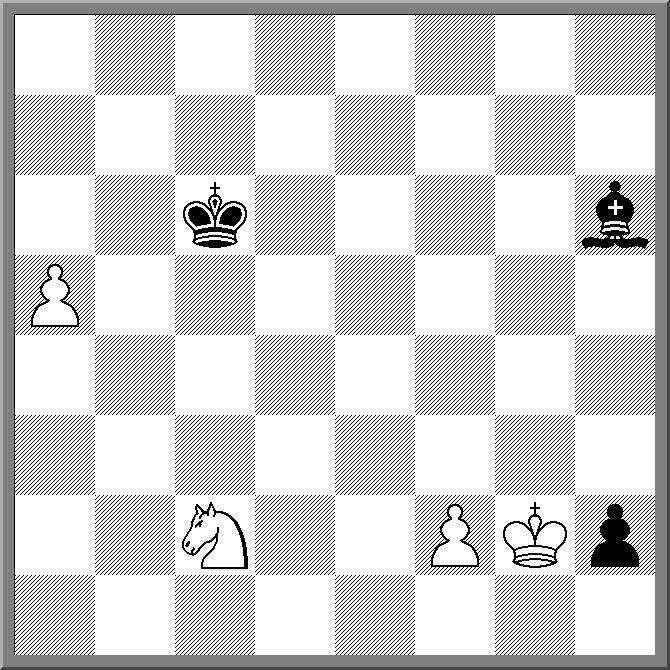 Take a 4x3 chessboard with 4 white knights and 4 black knights arranged at the top and bottom of the board. Label each knight A.B,C,D corresponding to the file they are standing on. 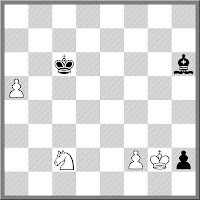 What is the minimum number of moves required to swap the position of each knight with its counterpart? 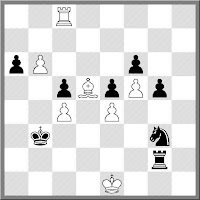 If you want an easier puzzle, place 2 white knights and 2 black knights on the corners of a 3x3 chessboard. What is the minimum number of moves to swap the positions of the white knights with the black knights (it does not matter which knight is swapped for which)? While flipping through a non chess book I came across a fairly simple acronym that describes a business planning process. The acronym is SWOT, and represents Strengths, Weaknesses, Opportunities and Threats. Of course such a term could have come directly from the world of chess, as I have read a number of chess planning books that describe this exact process. Turns out I was not the first person to make this connection, as I discovered a couple of articles linking the business approach to the chess approach. Probably the best of these was an article titled "Using Business Processes for Chess" by William Stewart. The only difference between his ideas and mine is he looks at Strengths and Weaknesses in terms of personal abilities (eg weak at openings/strong at endings), while I looked at the whole thing as a positional analysis tool (eg Strong knight on d5, weak pawn on b2). His article is worth a read as he explains the SWOT system better than I could, and provides a framework for asking the 'right' questions during the game. A couple of significant tournaments are starting up (or have already started). In Australia, the Australian Open begins on the 2nd of January 2013. At the current time, the field for the Open is close to 100 players, with 3 GM's and 6 IM's filling up the top end. Tournament details (entries, results etc) can be found here. My favourite tournament that I have never been to, Hastings, is also kicking off today (Friday). Check out the tournament website for more details on this historic event. And if you want a bit of chess 'humour', then this effort from the BBC may make you laugh (btw it does have a bit of language. You have been warned). Hopefully there are at least some of you who received chess gifts, or at least chess related gifts this year. This year I missed out on the chess presents, although I did get some pretty good non-chess presents instead. Probably the closest thing I got to a chess present was a book titled "The Grumpy Old Git's Guide to Life", from someone who has probably met too many chessplayers in her time. I'm currently playing a number of friendlies for Australia in Correspondence Chess, with the games all starting to get quite interesting. As is my habit, I normally follow established theory in the openings, having neither the time or ability to try and poke a hole in someone else's opening analysis. But occasionally I end up in an opening position which seems to be quite new. In one of my games I played a pretty offbeat opening, and got to a position where I seemed to be winning material. But I smelt a rat, especially as the reference work I was relying on seemed not to mention the piece winning line. Turns out my opponent had set an interesting trap, which had been played in a similar but different opening. Fortunately I decided to check the line in this other opening, where the whole trap was laid bare before me. As I am loathe to discuss actual games in progress on this blog (in case a helpful reader fills the comment section with analysis) I will offer the trap from the other line as a gift. 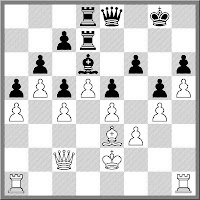 If you play against either the Alekhine's Defence or even the Scandinavian then be aware of the following trick. 1.e4 Nf6 2.Nc3 d5 3.e5 Ne4!? 4.Nce2 d4 5.c3 dxc3! Now 6.Qa4+ looks like it wins a piece but 6. ... Nd7 7.Qxe4 Nc5! leaves White in a heap of trouble. The Black knight is landing on d3 and will either fork on f2 or even support cxb2, and Black is better in either case. So best for White is to avoid the check, and simply recapture the pawn with 6.bxc3! Just in time for Christmas Eve, I've dug up another game played in Christmas day. It is from the 2000 Israel Championships and was between Mark Tseitlin and Lev Psakhis. The game was a fairly combative affair, but on move 26 Tseitlin overlooked the strength of Psakhis' queen sacrifice, and was forced to drop material. After that it was a matter of avoiding any tricks before Psakhis secured the point. An amusing end to a problem solving evening with my son. In working on the diagrammed position we came up with what seemed to be a pretty good solution, albeit a fairly long one. The solution seemed doubly plausible, as it revealed a number of tricks, including loss/gain of tempo, correct path of the kings etc. However when we checked our solution it turned out we missed one huge trick, which caused me to burst out laughing. As for my son, he came up with a number of inventive expressions, which while not actual swear words, were obvious replacements for them. 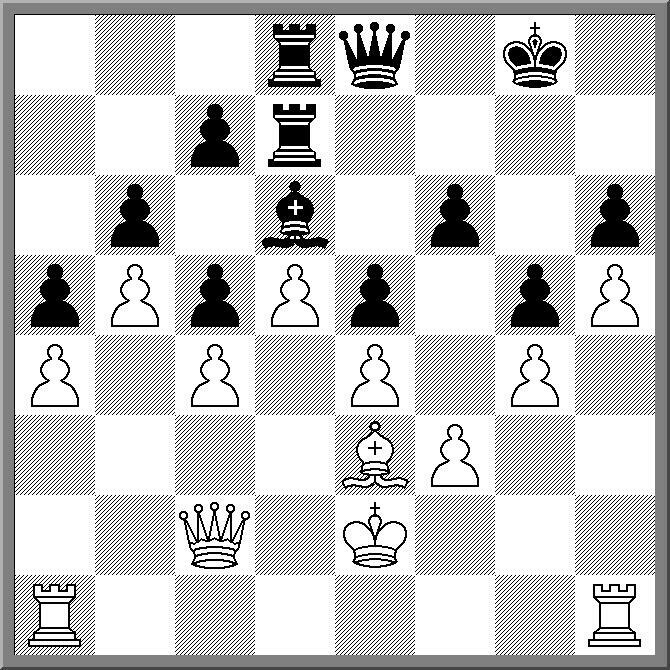 The study is by Richard Reti and it is White to play and Win. A good field of 36 players took part in the 2012 ACT Rapidplay Championship. FM Junta Ikeda was the top seed, with Yi Yuan, and IM Andrew Brown seeded second and third. With Yi Yuan a little rusty, the tournament was a battle between the 1st and third seeds. They met in Round 5, playing a very exciting draw. Brown seemed to have the edge for most of the game (or at least the bits I saw), and managed to promote twice in the ending. But Ikeda was always ahead on the clock and Brown was forced to liquidate to a 'dead' position to ensure a draw. After that neither player dropped further points and ended tied for first on 6.5/7. Junta Ikeda received the trophy and title on count-back, making it 4 wins in a row for him. Third place was shared by Elwyn Teki and Matthew Bennett, while Josh Bishop won the under 1700 prize. There was a 7(!) way tie for first in the Under 1400 category, with each player winning $7 (The odd dollar going into consolidated revenue). The event was also significant in that I got to apply the new 10.2c rule for Rapidplay games. A player with seconds on the clock claimed a draw due to insufficient winning chances by his opponent (indeed it was drawn with best, but obvious play). As he did not have enough time to 'show' the drawing method (he might have been able to play 1 or 2 moves at best), I grabbed a digital clock and set it for an increment. Although his opponent had previously rejected the draw claim, when he realised how the game was to continue (with his opponent receiving an increment), he immediately agreed to a draw without any further play! Around 10 years ago I received a 'Chess Puzzle a Day' Calendar for Christmas. Over the last few weeks I've had a look at the Calendar stands that seem to pop up in shopping centres around this time of year, and I have not spotted any. The closest I've seen are either Sudoku or 'Exercise your Mind' style calendars but none specifically dealing with chess. I suspect they aren't being made any more, but can anyone provide a counter example for this? (ie Have you seen the type of calendar I've described). The 2012 World Cities Championship (first mentioned on this blog here) starts in the next couple of days. Sacrificing a strict interpretation of the definition of a 'city team', the organisers have attracted 25 teams, after having planned for 32. Australia is represented by Canberra, although none of the team members actually live in Canberra (This seems to be a bit of a tradition in Australian chess btw). The first part of the event is a 4 team RR, with the best 2 teams from each of the 6 groups, plus the 4 best 3rd placed teams, qualifying for the second stage. Then it is a straight KO for the 16 teams. Alongside the event will be an individual swiss, which members of the knocked out teams can play in, carrying over their points from the teams event. While it all sounds a little complicated, the $150,000 prize pool should be enough to focus the players on chess. The tournament website is here. On one level I don't find playing blindfold chess too difficult. On another level, that of playing it well, it is a lot more challenging. Occasionally my son and I play against each other without a board while travelling in the car, but I make sure I'm not driving when this happens. Sometimes we even have time to complete a game, although when we replay it on an actual board, what seems to be a significant mental achievement is revealed to be a succession of confused moves and missed opportunities. At the top level the quality of blindfold chess is significantly higher. However blunders do creep in, although it is often just one big one, rather than a series of little ones. Case in point is this game from the 2012 Mind Sports Games between Mamedyarov and Aronian. Mamedyraov plays the whole game quite aggresively, and is rewarded with a advantageous position. However, in trying to defend a threat from Aronian, he puts his rook on an undefended square, and the game ends in one move. A valuable point for Aronian, who went on to take the Gold Medal in this event. The 2012 ACT Rapidplay Championship is on this Saturday, the 22nd of December. Traditionally this is the final title event on the ACT Chess Calendar, and usually attracts a strong field. As an added incentive, the tournament will be FIDE rated, allowing Canberra players the opportunity to add a FIDE Rapidplay rating to their other ratings. Prizes: First prize minimum $100, other prizes dependant upon entries. Frank Marshall once remarked that he opened with 1.P-Q4 as he felt he could get better attacking positions as a result, and much later, Gary Kasparov apparently expressed a similar sentiment. For the Miniature if the Month for November 2012, I present an extreme example of this, combining the Queens Gambit Declined with the Greek Gift (Bxh7+). While the game was only a rapid game, White still finishes the game of in a clinical and instructive manner. 11 year old Anton Smirnov has been crowned the 2012 Australasian Masters Champion after tie-ing for first with IM James Morris and FM Bobby Cheng. Smirnov defeated both Cheng and Morris in their individual games, and won the title on countback. The final round saw Smirnov paired with his father, IM Vladimir Smirnov, which in hindsight was a little unfortunate. Not only was Anton playing for first place, he also needed a win to earn an IM norm. This reportedly led to a Melbourne chess identity offering odds of 10,000-1 against a specific result, but a draw between father and son resulted in Anton missing out on his first norm. (As an aside, there was a brother - sister pairing in the final round of the Australian Junior Masters, and I suspect that arbiters may now be a little more aware of restricted drawing of lots for future RR events). In the other final round games, Morris drew with IM Guy West, while Bobby Cheng caught the leaders with a win over German visitor Arkadius Kalka. Tournament standings, plus some photos from the event, are available here. Back in Canberra after and exciting final round of the Australian Young Masters. In the top event Brodie McClymont scored one more win to end the tournament with a perfect 7/7. In the final round he faced fellow Queenslander Yi Liu, needing at least half a point to stay clear of Alistair Cameron. Instead he won a pawn in the middle game, and then won the subsequent Q v R+B ending. Cameron also had a last round win, after IM Andrew Brown overpressed an attack, and when it ran out of steam found himself in a lost ending. This left Cameron on 6/7, which in any other year might have been enough to win. In the Junior Masters, ACT players Matthew Bennet and Stu Mason tied for first on 6.0/9. Harry Press, who was tied for first going into the final round, continued his run of poor last round results, by losing to Josh Bishop, resulting in a tie for third between the two of them. In the South Australian Young Masters, Lachlan Cameron also scored a clean sweep, finishing the tournament with 9/9. Spent yesterday watching some of the games in the Australian Young Masters. The Adelaide Chess Centre is a nice venue, although it maintained the tradition of Australian junior events by being very, very warm. However the late morning rain cooled things down, although at the cost of leaking water on the top boards! In the chess, Brodie McClymont continued his stellar form, leading the Young Masters with 6/6. However he is being closely pursued by Australian Junior Champion Alistair Cameron on 5. In the final round McClymont plays fellow Queenslander Yi Liu, while Cameron plays IM Andrew Brown. In the Junior Masters Matthew Bennett and Harry Press share the lead with 5.5/8. Bennett plays Qi Le Kong-Lim in the final round, while Press plays Josh Bishop. If you wish to follow the final round the tournament website www.lidumsaym.com has a live blog hosted by GM Ian Rogers. I travelled across to Adelaide this evening, and plan to watch the last few rounds of the Australian Young Masters over the next 2 days. Curiously, this will be my first visit to the Adelaide Chess Centre, despite having visited the city at least 3 other times over the last 30 years. Hopefully my Internet connection holds up, and I can bring you some of the highlights from the tournament. You're all smart. Spammers are dumb. Feel free to ignore what they write. I know I will. In Australia (and I guess a number of other countries), we have School Athletic Carnivals, and School Swimming Carnivals. Everyone gets the day off to participate in a competitive activity, with trophies and medals normally awarded to the best performing students. Far less common is the School Chess Carnival. I spent today at the Amaroo School Championship, which had a field of 86 players from Year 3 up to Year 9. The numbers were restricted due to the amount of equipment available, as otherwise a potential field of 300 students (out of an enrolment of 1400) could have taken part. Even then we had to use the 'Indian' time control for the bottom boards, in that the top 30 boards had clocks, with the bottom boards doing without, until the final 10 minutes of the round, where clocks from completed games were placed on the bottom boards with 5 minutes for both players. The 7 round event ran very smoothly, as even the newcomers to tournament chess picking up on how it was all supposed to work, At the end of the day top seed Jennifer Ton won with 7/7, while Viv Lam finished tied for second with Nick Coffey on 6/7. As with other schools sports carnivals there were medals for the best scorers from each of the age groups, and each winner was given heart congratulations from their peers. Next year the school will hopefully be expanding the event to allow all the interested students to take part, so maybe I will be reporting on a 400 player event in twelve months time! Magnus Carlsen wrapped up first place in the 2012 London Chess classic with a final round draw against World Champion Viswanathan Anand. He finished half a point ahead of Vladimir Kramnik, who would have had the critics raving over his performance, if he hadn't been overshadowed by the Norwegian. But apart form the main event, there were a number side events, and these featured good performances from visiting Australians. In the FIDE Open, Ari Dale picked up a prize for the best performer in the 2000-2200 category. Interestingly, the prizes in the rating categories went to the player who had the best rating performance compared to their starting rating, rather than just on who scored the most points. Justin Tan picked up a prize in the junior category, although in this case it was awarded on total points. There were also a couple of weekend events, and IM Gary Lane tied for first in the second of these events, with 4.5/5. And if that wasn't enough chess, there were daily Blitz events, in which a number of Australian players, including IM John-Paul Wallace took part. If you wish to wade through the crosstables of the various events, then follow the links on the left hand side of the tournament website. Once new players get over their obsession with Scholars Mate, they usually move onto to more sensible openings. However it is often still 'make it up as you go' lines, so they still walk into some well known traps. One obvious variation (which I witnessed this very morning) is 1.e4 e5 2.Nf3 Nc6 3.Bc4 Nf6 4.Ng5 d5 5.exd (So far so good) Nxd5!?! Now normally this is considered bad, but at school level Black often gets away with it. 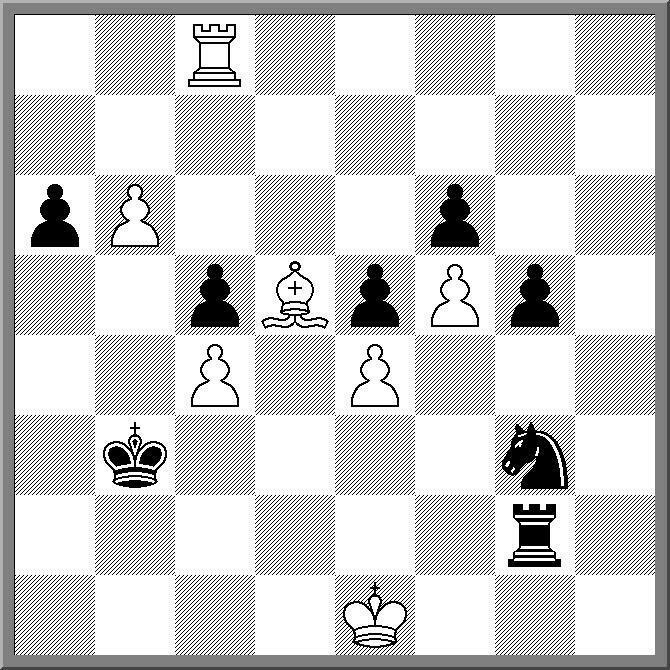 This is because at this level, neither player really knows opening theory, so moves like 6.Nxf7 or even 6.d4! aren't that easy to find. As I said to my class this morning, a move like Nxd5 is only bad if your opponent has read that Nxf7 is good. Of course once most players start learning a bit about openings, then the refutation of 5. ... Nxd5 soon comes up. Certainly it was one of he first things I learnt regarding openings, and I suspect most older opening books have this towards the front (normally quoting 400 year old analysis). Every now and then I come across an article which suggests that the sacrifice on f7 (with or without d4 first) isn't so clear cut for White, but if this was the case I would expect to see a lot more captures on d5 in higher level games. As I have not observed a tsunami of Two Knights games, then I will continue to believe it is more wishful thinking than cold hard analysis. There are two Australian tournaments running over the course of this week. The first is the long standing Australasian Masters which is being hosted by the Box Hill Chess Club in Melbourne. The field is a mixture of Australian, New Zealand, Russian and German players and is being run as a 10 player Round Robin, with IM norms on offer. Results and live games at the Box Hill Chess Club Website. The second is the Australian Young Masters, which begins on Tuesday. This event has been running for a few years, but seems to have found a home in Adelaide. The top section is an 8 player RR, with the Australian Junior Masters being run alongside as a 10 player RR. The event website is here. Given his current outstanding run in the 2012 London Chess Classic, here are some of my thoughts and questions concerning Magnus Carlsen. Will his performance lift his rivals? Who is likely to challenge him in the next decade? Caruana seems to be an obvious choice but is there anyone else? From various sources comes and interesting story out of New Zealand. GM Murray Chandler is looking to by a church, and turn it into a chess centre. St Pauls Presbyterian Church in Devonport (North Auckland) went on the market last year, after dwindling numbers resulted in its closure. Chandler, a Devonport resident has now put in a bid for the property, although it seems the idea of selling the church has met with some community resistance. Full(ish) details of this story can be found here. While commenting on the weird games in round 4 of the London Chess Classic, I missed the funniest position of all. It was the final position of Anand v Kramnik, where an impenetrable wall of pawns had been set up across the boards. When I saw it, it reminded me of how my brother and I used to play chess when I was 7 (and he was 5). At that time 1.e4 e5 2.c4 c5 3.a4 a5 4.g4 g5 5.d3 d6 6.b3 b6 7.f3 f6 8.h3 h6 was an acceptable opening variation, although I can't remember what happened next. I'm pretty sure that Anand and Kramnik weren't aware of Press v Press 1974, but their game does seem somewhat familiar. Round 4 of the 2012 London Chess Classic saw two pretty wild games. Aronian v McShane saw some bizarre material imbalances, with Aronian having 2 queens(!) v Rook and 2 knights (one of which was as a result of an underpromotion). Eventually Aronian was able to break the coordination between McShane's pieces and win. In Carlsen v Jones, Jones sacrificed his queen for 2 pieces and a lot of board control, but a shortage of time meant he was not able to find the absolute best moves, and eventually Carlsen made the material advantage count. However I am not going to show either of those games. Instead I'm going to dig into the archives and present a similarly wild game from 1904. It was from the Cambridge Spring tournament, and was played between Lasker and Napier. In one of my early chess books, this was given as an example of creative, and yet, slightly unsound chess. Lasker took more than a few liberties in the opening, while Napier missed a couple of opportunities to finish him off. Apparently after the game Lasker described it as "Napier's brilliancy, which I happened to win"
While discussing the current state of chess with my son on the way home from the club, he remarked on the absence of grand kingside attacks at the very top. He said he saw lots of queenside attacks, but not so many kingside ones. In answer, I thought one of the main reasons is that the modern style is a return the the Steinitz idea of the "accumulation of advantages". Of course being a modern implementation of an older idea, how it is done now is far different from Steinitz's methods. In fact it probably owes more the the Capablanca approach of 'little combinations', married with the practicality of Lasker's play. In essence, the modern game involves moving your position from 0.05 to 0.20 (according to the computer in your head), often via an accurately calculated tactical sequence. Once you get to 0.20, you then aim for 0.50, constantly improving as you go. The concept of a chess game as a series of tactical sorties struck me while playing through the Gawain Jones v Hikaru Nakamura game from the London Chess Classic. Especially around the move 20 mark, where Jones gave up the exchange, only for Nakamura to return it a few moves later. Once the tension in the position was resolved, what was left was BvN ending, which was eventually drawn after a significant amount of play. Ultimately, while the tactics were necessary, the end result was a position where technique counted for more than creativity. On Friday I gave a talk to the Year 7 Chess class at Amaroo School in Canberra. Chess is part of the curriculum at the school, and part of course involves the history of the game. My talk was on the more modern aspects of chess, with an emphasis on the top players since 1972. Apart from various players whose names started with K, one player I featured was of course, Carlsen. In the talk I featured a couple of facts on Carlsen, firstly that it was his 22nd birthday on the day of the talk, and secondly, that he had the second highest rating ever. Move ahead 4 days, and both those facts are out of date. Birthdays of course come and go, and in this case, so do rating records. By winning his first round game against Luke McShane in the London Chess Classic, Carlsen gained enough point to equal Kasparovs record, at least on the 'live' list. By beating Lev Aronian in the second round, he has now jumped clear of Kasparov, by around 5 points. The win by Carlsen had another effect in terms of the tournament, by relegating Aronian to the bottom of the field with 2 straight losses. This has also increased the gap between Carlsen and Aronian on the rating list, with Vladimir Kramnik closing in on Aronian. Of course there is still some chess to be played, so what we see in terms of ratings now, may not be reflected when a new lest is published in the New Year. The second day of the 2012 Australian Schools Teams Championship saw some teams extend their tournament leads, while others have a real battle for the National titles. In the Open Secondary Section, the colourfully dressed Scotch College from Melbourne ended up winning by a 5 point margin, over James Ruse (NSW) and Brisbane Grammar. A possible upset might have been on the cards after they were held 2-2 by Grammar in round 4, but a 3-1 victory over Lyneham High (ACT) in the 5th round allowed the defending champions to take the trophy back to Melbourne once more. The Girls Secondary Section was a lot closer, with Sommerville House (QLD) holding a half point lead over St George Girls High (NSW) with one round to play. However a 3-1 win for Sommerville over Radford (ACT), combined with a 2-2 result for St George against Alfred Deakin (ACT) padded the margin of victory. Greythorn Primary (VIC) scored a last round 4-0 win over Highgate (WA) to overtake Prince Alfred (SA) in the Primary Open Section, after Prince Alfred could only score 2 points against Summer Hill (NSW). This left Greythorn the winners by a narrow 0.5 margin. The Girls Primary Section was equally dramatic as Curtin Primary (ACT) emerged as surprise winners after beating Abbotsleigh (NSW) 3-1, and watching fellow ACT team Turner Primary take 2 points from previous leaders Somerset College, to eke out a half point win. Full results from all the events (including individual results) can be found at the ACTJCL website. Today saw the first 3 rounds of the 2012 Australian Schools Teams Chess Championship, at Hawker Primary School in Canberra. The event is run in 4 sections (Secondary Open & Primary, Girls Open & Primary), with 6 teams in each section. Senator Gary Humphries gave an opening speech, which was well received by the audience. As is traditional with a number of Australian Junior events, the temperature in the playing hall was very warm, as there was no air-conditioning on offer. However the provision of a number of fans dotted around the playing hall at least kept the temperature manageable. As each event is run as a round robin, determining a likely winner after 3 rounds is not that straightforward. Certainly Scotch College from Melbourne (11/12) seems to have inside track in the Open Secondary, but they still have a tough match against Brisbane Grammar to come. The other sections are a lot closer, with every point being crucial. Of the chess that I managed to watch, there was some quite entertaining games. With a time limit of 60m+10s a move, a number of games ended with time scrambles, providing the opportunity for some clever escapes and swindles. One example was the diagrammed position in the Girls Primary section (NB This is not the exact position, but is as much as I can remember). White pushed the b pawn to b7 aiming to promote, only to walk into Kc2, when mate is unavoidable. The tournament finishes tomorrow, with the final 2 rounds. Results for the event be found on the ACTJCL website.